The Supreme Leader has again rejected high-level appeals for the release of opposition leaders Mir Hossein Mousavi, Mehdi Karroubi, and Zahra Rahnavard from strict house arrest. Conservative MP Ali Motahari approached Ayatollah Khamenei three weeks ago, saying that the detentions — imposed in February 2011 — were harming the Islamic Republic’s reputation abroad and raising tensions at home. 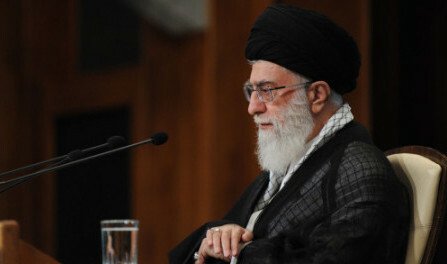 However, according to Motahari, the Supreme Leader maintained that the offences of the three leaders were too grave. He said that if Ayatollah Khomeini were alive, he would have been even more severe. Mousavi was the main challenger to the “winner” Mahmoud Ahmadinejad in the disputed 2009 Presidential election, and Karroubi also stood. Mousavi’s wife Rahnavard is a prominent academic, artist, and activist. If one of these individuals dies under these conditions, the situation would turn into an infected abscess for the Islamic Republic. I ask of you to call on the judiciary to end the matter. If need be, prosecute them and all other individuals involved in the matter and bring the matter to a close. Their offence is too big. If Imam (Khomeini) were alive, he would treat them more severely. If they were prosecuted, their sentence would be too heavy and for sure it would not please you. We have treated them with kindness. Khamenei also rebuffed an appeal by former President Hashemi Rafsanjani last month. A source close to Rafsanjani said the request to lift the house arrests will be renewed if Iran’s nuclear talks with the 5+1 Powers reach a comprehensive agreement. NextIran: Kerry Warns Tehran Over Nuclear Talks — Why?